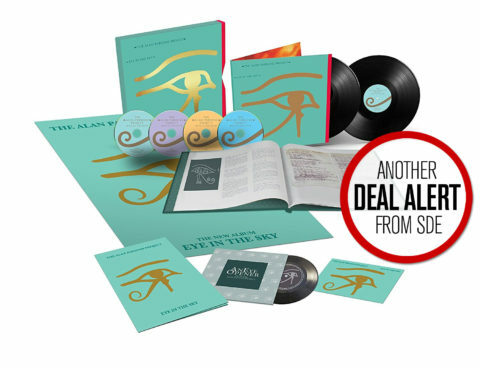 Great price on Amazon Italy for the forthcoming Alan Parsons Project Eye In The Sky super deluxe edition box set. This 35th anniversary package features three CDs of audio, two vinyl LPs (half-speed mastered and cut at 45RPM), a 5.1 Surround Mix on blu-ray audio (only with a hi-res stereo version of the original mix) a flexi-disc, a 60-page Book, and a 1982 replica poster. It’s available right now for around £66 (€75) compared to £83 in the UK. I’m with Alvin, the whole thing around SD Box sets is about more than CDs, DVDs or Vinyl. It’s the whole package, the look, feel composition about everything included. I have multiple boxes, some vinyl only, some cd only, some a mixture (which I prefer), and yes some with additional items that I could do without, marbles, Flexi discs, paperbacks, ticket stubs etc, but none of these stopped me buying the set. I only wish side D would contain as extra tracks the three edit versions, as it did on the 2xLP version from Tales. I suspect these will show up as a 3-track 7inch on (Black Friday) RSD, much like the three edit versions taken from TTOAFC did. Anybody knows if there is an extended version of breakdown? Maybe doesnt exist. I’ve found others APP extended versions tracks but not with this one. That song ends on the top, just at the most orquestal moment with the chorus, I wish APP had made it longer….. I pre ordered this in august from Amazon Italy for 74€. The “Tales..” boxset was fantastic. I have a turntable and the 45rpm provided in the “Tales..” boxset sounds great. The 5.1 mix is also fantastic. The “Eye..” boxset is a must buy for me ! Thank you Paul for the deal alert. Not crazy about the vinyl either but got it anyway. I do support the “Separate Vinyl and CD’s Movement”, it adds to the cost for no reason. I have tons of SDE’s and all vinyl’s are still in the box unplayed, not even pulled out to look at it. A useless cost for me and many others. I’m a bit comprehensive about CD 2. Are we getting 1 to 2 minutes of “Songwriting Diary” or are these actual songs? $85 for CD 1 I already have, vinyl I won’t use and CD 2 with just vocal try outs of 1 or 2 minutes may not be the best deal I ever made when it comes to buying SDE’s. I know, I can also not buy the entire thing but I’m a fan and going on a limb with this one. The deal alert pulled me in. I’m a bit apprehensive, not comprehensive….sorry, autofil on my phone. Again with the unnecessary vinyl. S E P A R A T E these from a CD Box and make a special vinyl only box, please. Thanks to Boaz for posting the remix link. It would be nice if that was on there as well, but despite wanting this, I am not going to get it until the vinyl is removed and the cost goes down, so probably never. Or the Japanese-only version of The Doors debut album with CDs but no vinyl. …. Last time I checked this website was still called “Superdeluxeedition.com”. Why bother to check this site, if a Deluxe Edition is not your thing? I really don’t want to step on anyone’s toes, but the amount of “bashing” when it comes to deluxe editions is staggerinly high for a website catering to fans of, let’s see, deluxe editions. If you only want single cd’s or a stand-alone blu-ray, that’s fine, but why on earth would you visit this site and then spread some negativity amongst people who actually crave those big box sets with all of their bells & whistles (and yes, even scarves if needbe). I just do not get it. The same goes for all of you vinyl-haters. Even if you never play that “superfluous” vinyl in the set, it still is a fantastic addition to a Super Deluxe Box Set, which should to the full extent commemorate and therefore indulge in every aspect to create something really special. First and foremost, these are for the most part collector’s items. I can even imagine people buying them, opening them up to inspect the contents and then never playing a single disc, because they can just stream it over the internet. People, please, stop it already. To each his own. If this is not your thing, then by all means don’t buy it, but for the love of music and collector’s around the globe, please stop oozing that pointless negativity. It’s not “hating” or “bashing” or negativity but a gripe many of us have with editions that are overpriced and badly put together. Complete nonsense. Many sets are expensive enough without vinyl. Why should I pay the double amount of what it would cost if it only included the discs I’m interested in? Sorry, I’m going to save my cash and spend it on other things where I’m not being force-fed expensive items I have no use for. There are many people on this site who say that formats should be kept separate. Certainly vinyl caters to a different crowd than CDs and BDs. Those who want both can buy both and will probably not pay much more than this costs as a package. This is not pointless! Paul has made this point several times (and as the guy who runs this website he surely has a point there, eh?) and only if we repeat it often enough, the industry will learn from its stupid mistakes & possibly even sell more units. There seem to be two camps here. On the one end those who collect Deluxe Editions of albums they like and don’t mind the vinyl, because it does add. Most of the albums that are the subject of a deluxe edition, were originally pressed on vinyl. A proper deluxe edition, in my opninion, should therefore always acknowledge that or even better it, by creating a 45rpm pressing for instance. A deluxe edtion is not all about the audio, but essentially also about the feel and look and the attention to detail. On the other hand we have those who are only interested in the music only and therefore not necessarily in a Deluxe Edition per se. Sure, there is absolutely nothing against an array of cd’s in a non-descript cardboard box in order to diminish the cost, but we are not talking a Deluxe Edtion then. It really is a different beast and it will always cost you money, which is, I suspect more of a gripe with camp two, then its proponents will let on. I understand fully there’s a need for stripped down boxes which focus solely on the musical and mostely unreleased content. But once again, this is Superdeluxeedtion.com. In others words it will mostly deliver news on goodies for camp one. So, here’s my point, what is camp two even doing here? How is the inclusion of something you’ll never use, and don’t want – that puts up the price of a box by a good margin, “a fantastic addition”? It’s only a fantastic edition if it serves a purpose. The issue is the extra cost it causes. And having a opinion on an item that is different from yours, isn’t pointless negativity…. This is a nonsensical criticism. One can certainly be ‘into’ deluxe compilations, but not into *a particular configuration* of a deluxe compilation. Good grief. No kidding. For me it’s still 75 euro for three CDs and the book. As much as I love this album, I can’t justify that. Grabbing the Super version of this as I really, really want the 5.1 mix. The 5.1 mix will be released on its own, as was the Tales of Mystery 5.1 mix. Yeah, I keep waiting for news about the stand-alone “Eye…” 5.1 Blu-ray. SW for example, had already made the stand-alone 5.1 Blu-ray of his last release, available by this point; but then again, his SDE allotments were sold out. I don’t remember the “Tales…” 5.1 stand-alone Blu-ray ‘drop-date’ in relation to the the ‘street date’ of that SDE. Any insight? Any news? Anyone? Tx. Cheers, All. A 2017 remix of Sirius was released to promote the re-issue. This will not be included in the release. That’s bizarre. Why remix it and then not include it? Weird thinking. The set has vinyl and CD and blu-ray–too much. Give me one or the other. I hate duplication.